When students develop a maker mindset, they learn to think divergently and solve problems by connecting seemingly disconnected ideas. Here, students also engage in iterative thinking as they move through the creative process. In the makerspace, students learn how to tinker and create rapid-fire experiments. However, students also learn how to work through the entire design process, ask wild questions, engage in hands-on research, and ultimately generate innovative ideas that they develop into authentic products that they launch to the world. Along the way, students learn project management and systems thinking, figuring out how to navigate complexity. They also become hackers and rebels who can change the world. In other words, they become innovators. 2. Makerspaces encourage interdisciplinary learning. We often hear about the need for STEAM, rather than just STEM. However, a makerspace goes beyond the STEM/STEAM debate and into a fully interdisciplinary approach. A makerspace is simply a space designed for hands-on creativity and prototyping. Students might do coding, circuitry, and engineering. They might also film documentaries or record podcasts for a documentary that blends together elements of science and social studies. In the process, students learn how to make valuable connections between the subjects and content areas that we have traditionally placed into silos. 3. Makerspaces can help promote equity. Although the gender gap is closing within the sciences, especially chemistry and biology, it remains stagnant in engineering and increasingly worse in the computer sciences. When teachers design gender-inclusive makerspaces, schools can help make strides toward reducing this gender gap. The same is true of students of color and other underrepresented groups. A makerspace is also an opportunity to embrace neurodiversity in creative thinking and engineering. Instead of limiting creative projects to students in gifted or honors programs, students who are English language learners or exceptional learners can have access to these same types of opportunities. Tasks and creative opportunities can be designed for any kid at any skill level. 4. Makerspaces are a perfect place to develop a growth mindset. If we want students to develop, we need to give them slack. However, schools are often high-stakes environments that place a premium on getting the correct answer the first time. Students grow risk averse. On the other hand, a makerspace is a safe place to fail. Here, students internalize the idea that every creative work is an experiment full of iterations. They learn that failing is temporary, while failure is permanent. In a makerspace, students get the opportunity to see that failure isn’t permanent and that talent isn’t fixed. This helps fuel what Carol Dweck describes as a “growth mindset.” Dweck describes two types of mindsets a learner can have. The first is a fixed mindset, which suggests that your abilities are innate and unchangeable. The second is a growth mindset, which views it as something you can improve through practice. Those with a growth mindset will view obstacles as a chance to experiment and solve problems. It turns out, a makerspace is an ideal place for students to develop this growth mindset. 5. Makerspaces improve student agency. In a makerspace, students are constantly making their own decisions. They decide what they are creating and how they are going to create it. Students choose the supplies, the approach, the scaffolds, and the topics. As they move through the creative process, they learn how to monitor and adjust on their own. This helps boost student agency and self-regulation. 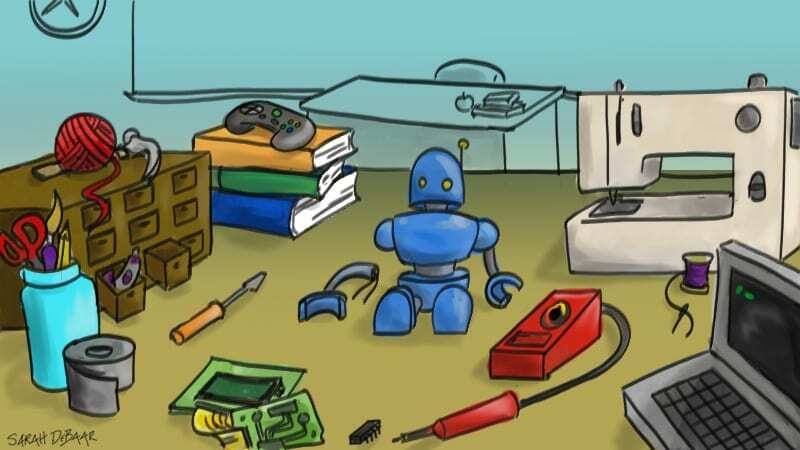 It is easy to fixate on what types of products should go into a makerspace. What kind of 3D printer should you buy? What type of CAD machine works best? Do you go with Arduino or Raspberry Pi or both? But, actually, the most powerful element in a makerspace is the teacher who inspires creative risk-taking among the students. They can do this by creating a space that encourages students to dream and wonder and design. If you are interested in makerspaces but don’t know where to begin, this blog is a great place to start. John is a former middle school teacher, current college professor, and bestselling author of the books Launch and Empower. He also loves making stuff.